There are some trends that creep up on you. Nothing radical, but a modest movement which gradually makes itself evident. Acoustic lighting is a case in point. The general case for considering lighting along with acoustics in offices has been promulgated for some time. Andrew Bissell, head of Cundall Light4, has for some years been working with his acoustic counterpart, Andrew Parkin, to create more cohesive solutions in this respect. ‘Light and acoustics are two fundamental elements that are very influential in how we perform and operate within a space,’ says Bissell. ‘Equally, these two elements are typically very visible within a space even if the equipment is recessed into the building fabric or the furniture. Generally these systems are bespoke but the evidence of growing awareness and demand in this area is the gradual increase in o.-the-peg combined light/ acoustic fittings. So why this increasing demand? For one thing, as in so many other areas, LEDs allow an easier, sleeker integration of the lighting component. Bissell says that more products are coming on the market ‘but it is one at a time and quite slowly..We are certainly not seeing everyone jumping on board..That, however, may change given that even lawyers are now showing an interest in edgy exposed-concrete so.it offices.. These are the sort of places you need good acoustics and therefore an opportunity to combine the lights and acoustics for visual and acoustic clarity’. There is a potential drawback in the combined fitting in that, for instance, the positioning of the lighting might be compromised by the acoustic element. Bissell believes there are pros and cons. ‘I have mixed feelings about combined systems as on the one hand they create neater and less cluttered solutions, while on the other hand you are more limited in your options if you want a combined system, as there are fewer products on the market..
As the following selection of combined fittings shows, they are far from being simply functional and can form striking design elements with a variety of applications. 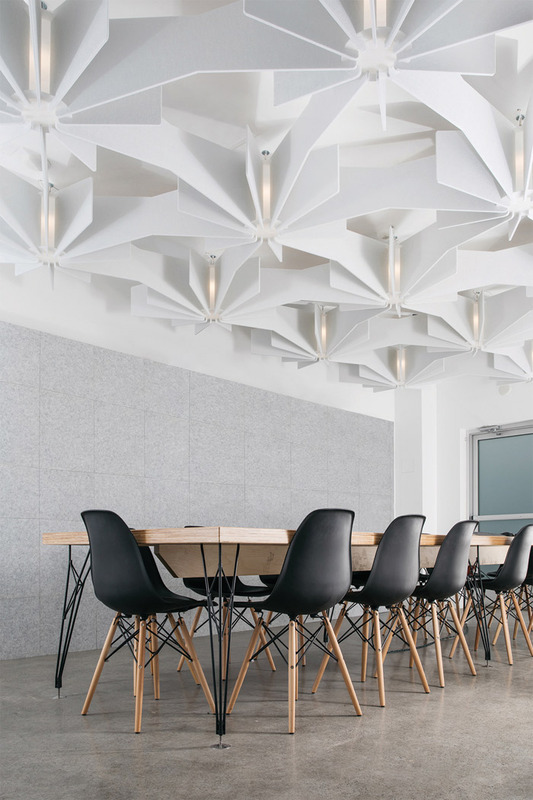 If a luminaire is going to be positioned in a particular location over a meeting table or break-out space, why not make it work harder and act as a noise absorber as well? The Ac-lipse range features customisable 12mm acoustic panel and frame colours, and allows the angle to be adjusted to change the light direction. There is a standard range of five colours for the panel (light and bright blues, light grey, charcoal and green) with a further 11 colours in the premium ranges. Frame finish is in black, brass, silver or copper. The LED light source is 60W (3000K and 4000K, CRI 80) with an output of 5000lm. 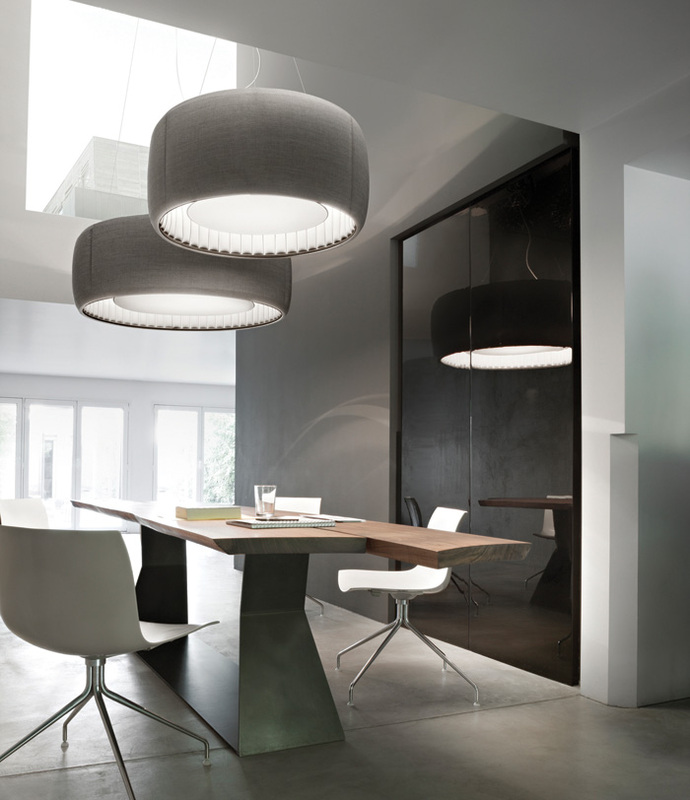 The Vapor Echo is an acoustic version of an original light fitting and comes in three sizes: 500mm, 1000mm and 1500mm. Both this and the rectilinear version feature 12mm acoustic panels, and come in the same choice of colours as the Ac-lipse. The Echo has multiple options for light distribution: direct (small size only), indirect (small) and a combination of the two (medium and large), and a choice of colour temperatures: 3000K, 3500K and 4000K. The shade is made from Soundfelt upholstered in wool fabric that comes in a standard grey with black accessories. Other fabrics and colours are available on request. The fittings comes in 11W, 20W and 31W (3000K, CRI 80) options with an output of 650lm, 1230lm and 1920lm respectively. The 31W version has a direct/ indirect distribution while the others are downlight only. The 11W version is 600mm x 400mm, the higher output options are 1200mm x 400mm. BuzziZepp was conceived as an ‘imaginary island’ to visually define zones within large open environments. 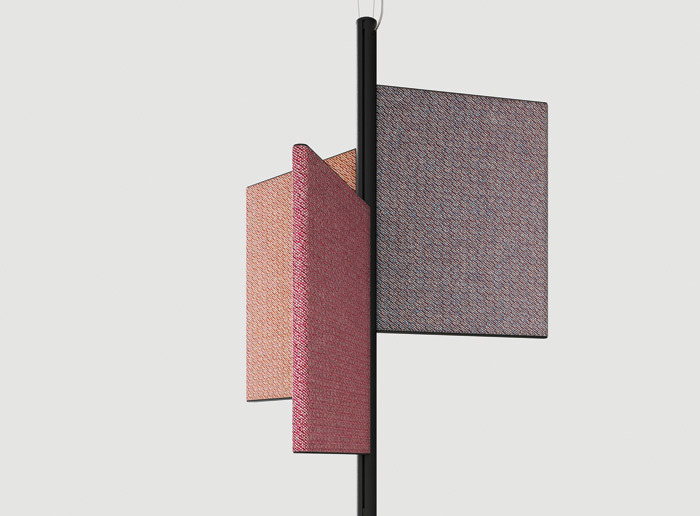 The slim framework is made up of upholstered acoustic panels. The dimmable linear LED component (3000K, CRI90) has an output of 2300lm-4600lm according to size. 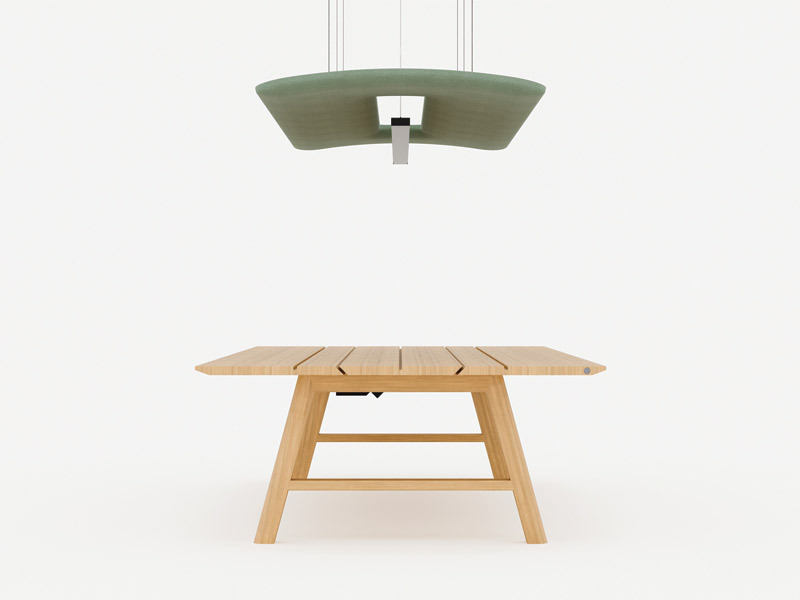 Also designed by Gilles, he intentionally designed his pendant to feel less technical with a ‘playful cartoon-like form’. The fitting is customisable with the option to mix and match finishes and materials. The upholstered foam body is available in a variety of colour and fabric combinations, while the metal shade and ring detail are offered in gold, black, white, beige and red). 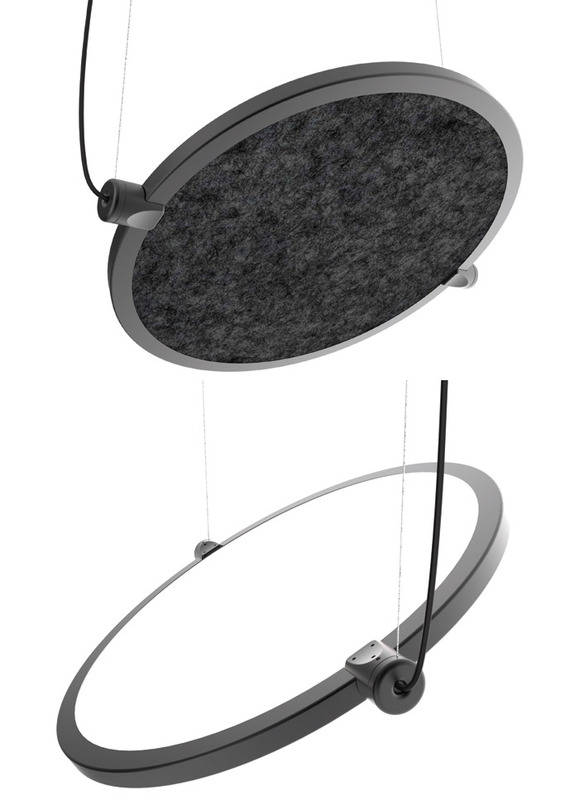 The upper module is available in four sizes to absorb more or less sound depending on the size of the room and need, ranging from a more compact and rounded ‘cap’ to a larger and more elongated ‘top hat’. With a 3000K LED source (CRI 90), the output is 2000lm. 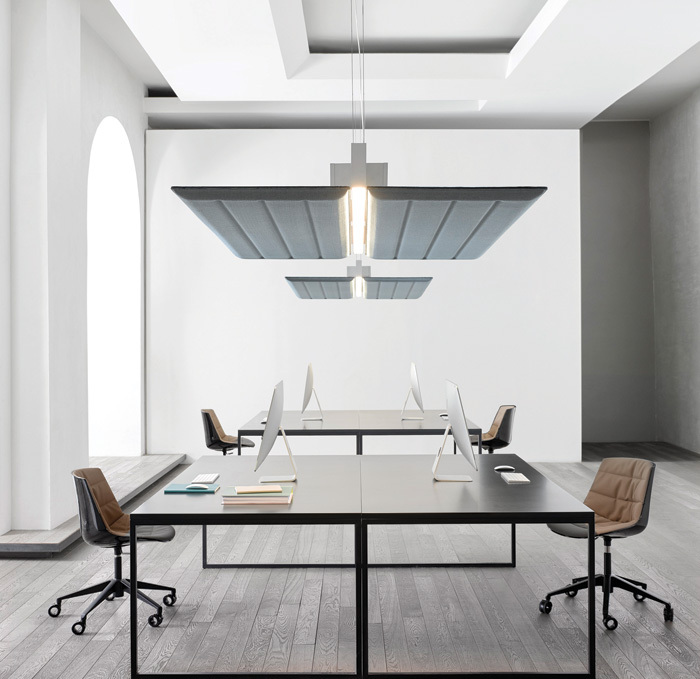 Also available in a pendant version, the grid option of Echo is a full ceiling acoustic and lighting solution, although it can also be used in smaller clusters. With either eight or 12 PET felt fins, it comes in 12 colours, ranging from monochromatic to brighter hues. The diffuser is a frosted acrylic tube that can be removed for a brighter output. The dimmable LED source is 9W (3000K, 800lm) as standard. Higher output options are 11W (3000K, 1100lm) and 15W (3000K, 1600lm). 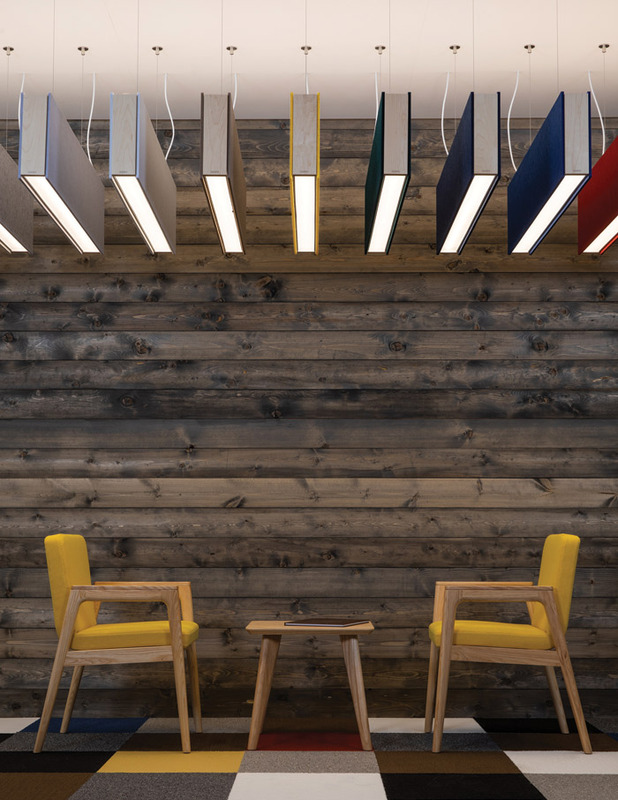 A beam-shaped suspended modular lighting solution, Static offers two-directional lighting and has one per cent dimming. This year the company introduced 13 new felt colours and a wide range of custom colours for the itting’s metal endplates. The Philips Fortimo LED strip module is sandwiched between two layers of sound-absorbing PET felt. Size ranges from 125cm x 10cm x 10cm to 248cm x 40cm x 10cm. 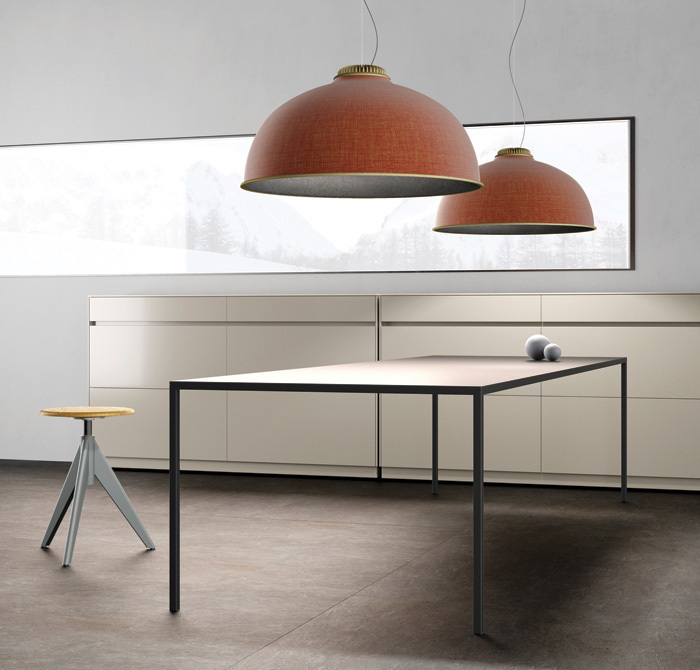 Trypta, a system of suspension lamps, is the newest addition to Luceplan’s acoustical lighting collection. With a cylindrical aluminium body, it has two dimmable LED sources, at the top and bottom, providing both direct and indirect diffused light. 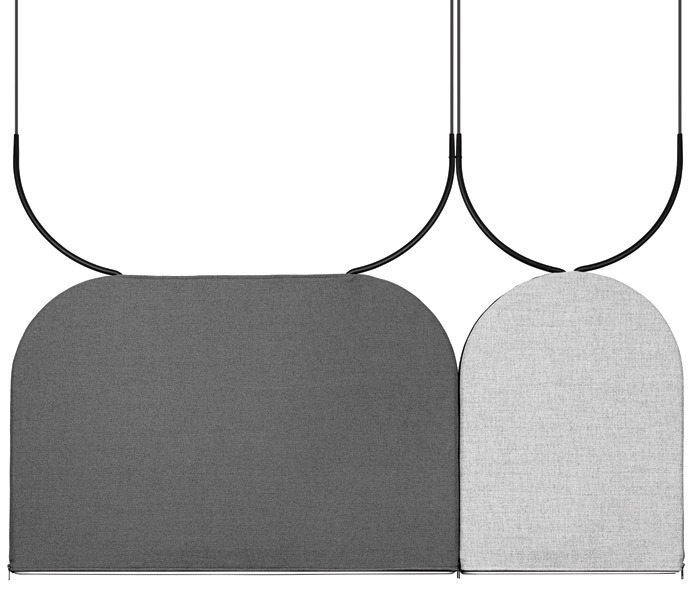 The body of the fitting comprises three acoustic panels positioned at 120 degrees. The core of the panels is made of a high-performance soundproofing material, covered with fabric in two collections of three colours: the ‘soft’ collection with a mix of smooth hues, and the ‘pop’ collection with more vivid colours. A second addition to the range is the Farel pendant, a classic cupola. Made of sound-absorbing thermoformed material, with outer fabric cladding, the internal ribs create a subtle chiaroscuro effect. 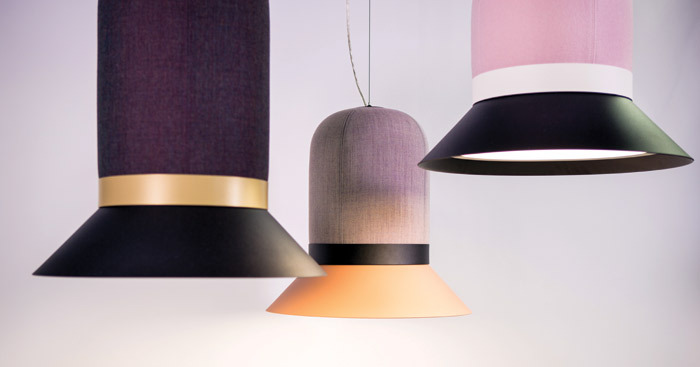 The 80cm-diameter fixture allows for a degree of customisation coming in four fabric options, with cool, warm and neutral colours for the outside that can be combined with dark or pale hues for the inside. Two optional metal rings can be added at the top and along the lower diameter, coordinating with the heat sink in a range of finishes: matte aluminium, matte black and matte brass. The light source is an integrated dimmable LED module (32W, 2700K, CRI 90). ‘Farel comes from the observation of certain architectural structures that exploit zenithal light to brighten spaces,’ say Sferrazza. The Silenzio fixture is covered in grisaille-type Kvadrat fabric and comes in four colours as standard with customisation available. There are two sizes, 90cm and 117cm diameter, and light source is a 40W LED module. 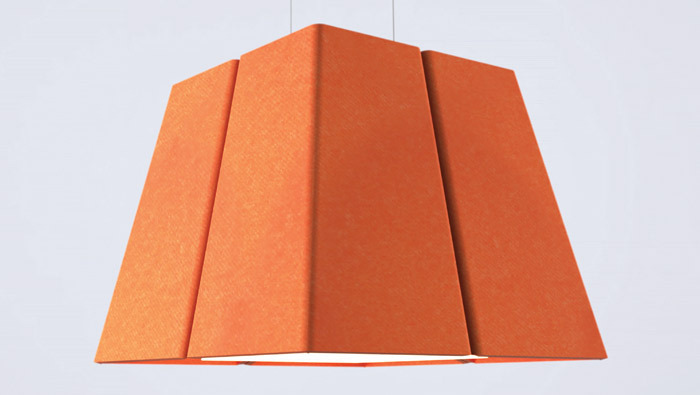 Diade is a modular, suspended architectural feature with a sound-absorbing panel in moulded PET. The two wing panels can be positioned vertically or horizontally to create a partition or a large ceiling element. The LED distribution can be direct (vertical installation) or direct/indirect (horizontal). In two sizes, 120cm and 180cm; the smaller version is 45W for direct output and 45W + 35W for direct/indirect. Colour temperature is a warm 3500K. With a polycarbonate dome covering the light source, Pétale is covered with white fabric and made with a sound-absorbing panel. The fitting comes in an RGB.DMX version with a dual LED light strip. The central LED module generates diffused, warm white light (3000K) and has a high lumen output. 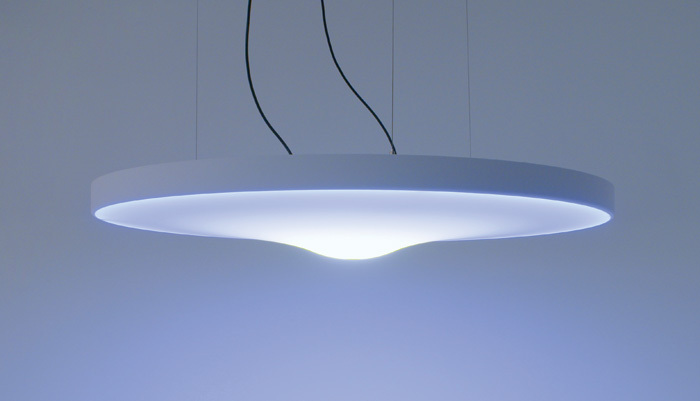 The second RGB and tunable white source is positioned on the outer pro.ile and lights the perimeter of the body, graduating the light towards the centre of the fixture. Through the DMX-controlled mix of RGB and white LEDs at different colour temperatures, it is possible to obtain wide colour variation and variable tones of white light, from 2400K to 6000K.